The British government has published its proposal on the "backstop" policy to avoid a hard border on the island of Ireland. It proposes keeping the whole of the UK in conformity with EU customs regulations - not just Northern Ireland. The British government said it expects that to be by the end of 2021. However the Taoiseach said the "backstop" agreement cannot be time-limited by a date. In a position paper issued today the British government said the temporary arrangement only comes into force if there is a delay in the implementation of the end of state customs arrangement. 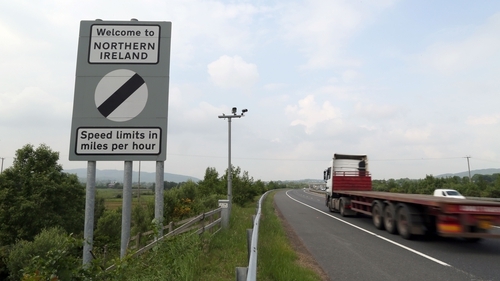 The paper states that temporary "backstop" arrangements to prevent a hard border between Northern Ireland and the Republic should not continue beyond December 2021. Earlier, Taoiseach Leo Vardakar said the Irish "backstop" agreement on Brexit cannot be time limited by a date. Mr Vardakar said that the agreed Irish protocol, or backstop, will apply until there is an alternative place or a new relationship between the UK and the EU that prevents a hard border. He said it "has to be all weather and applicable until if and whenever" a new agreement emerges that ensures there is no hard border in Ireland. Tánaiste and Minister for Foreign Affairs Simon Coveney has said that he looks forward to discussing the UK's proposals. In a statement, he said "it remains vital that a legally-binding backstop is agreed to provide certainty that, in all circumstances, a hard border will be avoided." "It remains vital that a legally-binding backstop is agreed to provide certainty that, in all circumstances, a hard border will be avoided." Minister of State for European Affairs has said the Government will take time to examine the text of the proposal, along with the EU negotiating taskforce and chief negotiator Michel Barnier. Speaking to RTÉ News, Helen McEntee said: "As Michel Barnier has pointed out we need to apply three questions. Firstly: whether it is operational, whether it can be put into a legally operational context. Secondly: whether it in any way impacts on the integrity of the single market or the customs union. "And finally, if it will work in all weathers. In other words, will it apply in all circumstances? It's important that we take the time to examine the text and whether or not it warrants further negotiations." Fianna Fáil said the proposals from the British government today do not provide any clarity on the Irish border issue. The party's justice spokesperson, Jim O'Callaghan, said the time limit on the "backstop" is not acceptable. He said that a legally binding text on this question must be delivered. The EU's chief negotiator Michel Barnier said on Twitter that he welcomed the publication of the UK proposal on customs aspects of the Irish "backstop". He said the EU negotiating team will examine the proposals with three questions: Is it a workable solution to avoid a hard border? Does it respect the integrity of the Single Market and Customs Union? Is it an all-weather backstop? Guy Verhofstadt, the European Parliament's Brexit co-ordinator, said the "backstop" announcement was unlikely to resolve the problem. In a tweet he said it was difficult to see how the UK proposal on customs aspects of the Irish "backstop" will deliver a workable solution to avoid a hard border and respect integrity of the Single Market and Customs Union. A spokeswoman for British Prime Minister Theresa May said the UK is looking forward to negotiating the details of the "backstop" plan with the European Union. She said: "What's important now is that we now have a published, agreed piece of government policy," she told reporters. Asked whether the British government was confident the EU would accept its proposal, she said: "It's important to say the EU put forward their proposal, we were clear that we rejected that, and it was unacceptable. This is our counter proposal and now we look forward to discussing it further with the EU." Earlier today, Mrs May held what was described as "constructive" talks with Brexit Secretary David Davis. The comments followed speculation at Westminster that Mr Davis had considered quitting over a dispute regarding the backstop proposals. Mrs May also held separate face-to-face discussions in her parliamentary office with the two other leading Brexiteers, Foreign Secretary Boris Johnson and International Trade Secretary Liam Fox. None of the three ministers threatened to resign during the discussions, a spokeswoman for the prime minister said. The divisions on the backstop initiative emerged after Mr Davis was believed to be insisting the UK should be able to unilaterally withdraw from any border agreement in order to maintain leverage with Brussels in ongoing negotiations. When pressed on whether he could remain in post if the backstop deal did not meet his full approval, Mr Davis said yesterday: "That's a question I think for the prime minister to be honest." The cabinet wrangling came as Mrs May faced a battle on a second front as she tried to persuade Tory rebels not to go against her when the EU (Withdrawal) Bill returns to the House of Commons on Tuesday. Mrs May is determined to stop Tory MPs inflicting humiliating defeats on her by siding with amendments backed by the House of Lords.